Semantic mash-up floatlets are components that can be easily plugged into any web page for injecting semantically relevant content from a semantic portal to the current page. Floatlets are a new way for utilizing and publishing content in semantic portals and for interlinking portals efficiently and semantically correctly. For example, in the screenshot of a demo application the video archive YLE Elävä Arkisto has been semantically linked with the relevant content in MuseumFinland by the widget on the right bottom corner. 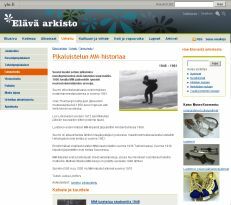 In this case, the current web page is about the history of speed skating and the widget shows old skates from MuseumFinland. By clicking on the widget links, the skates can be examined in more detail in MuseumFinland. Floatlets provide additional functionality or content to the web page by communicating with external semantic portals using the Web 2.0 AJAX technology. In the simplest form this means showing content from external semantic portal, but interaction can be more complicated. For example the widget can offer rich custom search or some other type of interaction user interface to the external semantic portal.